Seth G. Jones’s A Covert Action tells the true story of a CIA program code named QRHELPFUL. 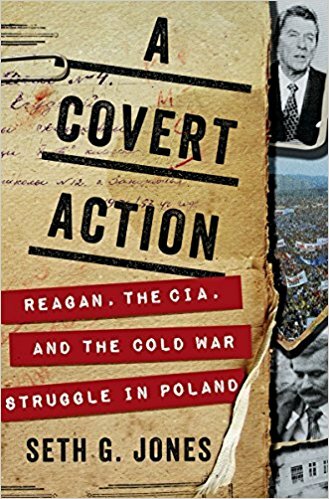 President Reagan directed the CIA to start this program after the Polish government cut off telephone contact with the West and Prime Minister Wojciech Jaruzelsk got ready to declare marshal law. The CIA used contacts in the Catholic Church, recruits within Poland, and recruits from nearby countries to smuggle funds, printing equipment, computers and more to Solidarity, a political/grass roots workers group lead by Lech Walesa. A fascinating story and one where with Western help, Solidarity was able to in less than a decade changed Poland for the better and without resorting to violence. When Reagan came into the office as President I was a baby and was 11 when he left. For years I thought of him as the gentle grandfather type who really pushed back against communism by letting his words and backing actions from Congress do the fighting for him. I have since come to know that President Reagan has more facets to him. Also he did many things behind the scenes like QRHELPFUL without public knowledge. Through this program Poland came out from under communism without having the use the U.S. military to make it happen. A Covert Actions is a good read full of informative facts and quite engaging.